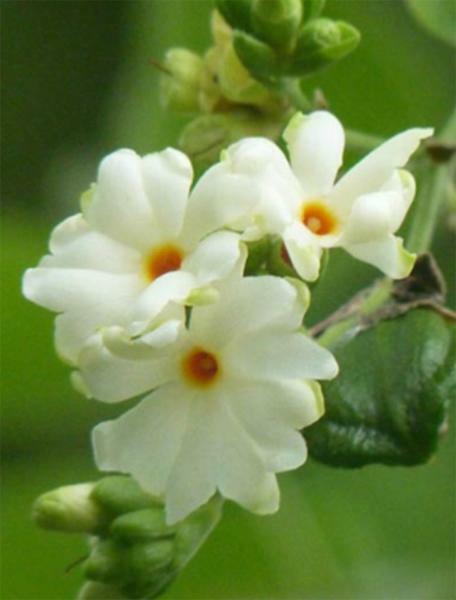 Parijata is also known as Night-Flowering Jasmine as the small flowers resemble Jasmine, bloom around dusk and close around dawn. The Parijata tree (Nycatanthes Arbortristis) is known as the Sad Tree as the flowers drop each day after opening. Don't assume this is just another Jasmine though - Parijata is more subtle, gentle and broader in its tones. This scent is complex - you should notice resinous woody base notes, distinct fruity/floral mid-tones with an unusual spice top note. So this is a woody/floral, again quite different from floral Jasmines. Parijata has been used in Ayurvedic medicine for millennia and is another flower sacred to Hindu's, with many associations with Lord Krishna. Legend tells that he brought this tree to earth from heaven at the request of Satyabhama, one of his wives.